Do you know that 34% of burglars enter through the front door, ranking as the most common entry point for thieves, according to statistics? The front door camera is absolutely a big necessity in home security. With a front door camera, you could be alerted by visitors’ arrival, know who they are, speak to them via your phone, and most importantly, keep your home protected from break-ins! It is a tough task, though, to choose from various types of front door cameras. For example, the front door WiFi camera which is easy to install; the front door motion detector camera which sends you alerts whenever danger occurs; and the front door camera with monitor that enables to see who is arriving. Today I’ll help you pick out the best front door camera with a simple guideline: Match your requirements with the front door CCTV features, you’ll find the decision quite easy actually. The front door camera is the most effective way to ensure home security. In fact, an exterior front door camera already comes as deterrence to vandals. Well, a megapixel motion activated front door security camera goes a step further to help you catch the burglars, who take the chance during your absence, with faces and plate number details. With a motion front door camera, you will receive real-time push and snapshots/videos immediately if anyone tries to break into your house. Better still, if you got a front door camera with speaker, you can see and warn the burglar verbally instead of doing nothing while you are miles away. And make sure you get an HD front door camera – 1080p or higher resolution, to be exact, in order to identify the license plate and people’s faces. So In rare cases when the verbal warning doesn’t work, the front door IP camera recordings would be helpful to the police. 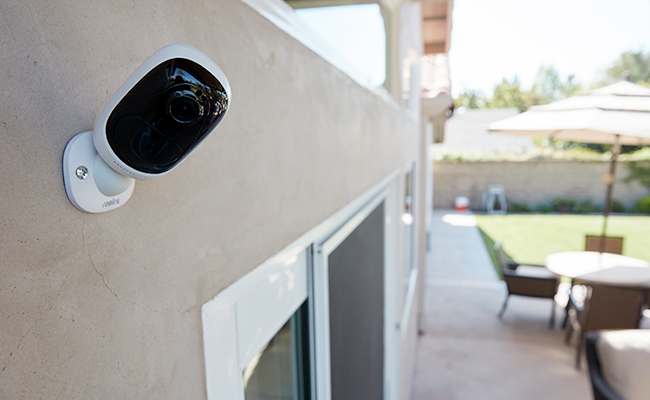 If you want a more comprehensive protection for home, a front door camera system is needed with an NVR for video storage. The large storage space (at least 1 TB) makes it possible for the round-the-clock recording and protection. Of course, make sure the front door IP camera is night vision enabled. A front door camera could also be useful to kids. Do you occasionally leave your children alone at home for shopping? Picture this: A stranger comes to your house and your children could not tell who it is by a single doorbell and opens the door or make the wrong judgment by pretended voice. If this is your concern, a smartphone front door camera with monitor will be your right choice. With the front door camera linked to cell phone/iPad, children will be able to get the live view easily and see the visitor before answering the door. Besides, pay attention to the front door camera app interface, and make sure the app is clear and easy enough for children to operate. More than that, the front door camera could also be a reassurance for parents. Just link the front door camera to phone with 3 easy steps, you could review the camera footage remotely and know who has visited your house. The wireless front door iPhone camera can also tell you whether your kids arrive home safely from school via simple clicks. 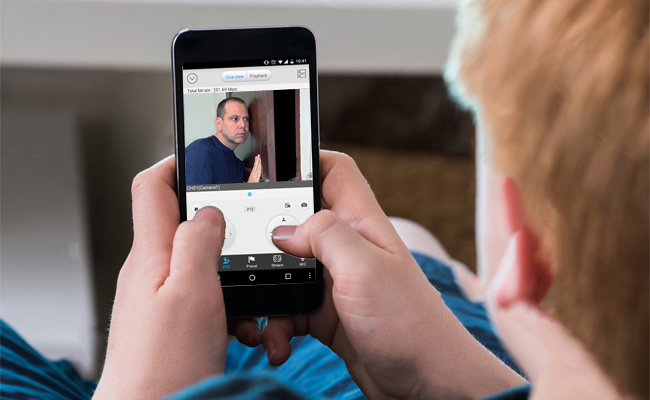 Extra Tip: It’s advised to choose an Andriod/iPhone front door security camera with companion software, like the Reolink client, so that you can fully play all the front door security camera features without compatibility issues. You’ll find the front door CCTV camera helpful in managing the delivery and other services or visitors. Ever come across the embarrassing situation when the doorbell keeps ringing and you want to sleep in? Ever experienced the dreadful feeling when you struggle to open the door only to find a salesman there? If your answer is YES, then the front door camera with monitor and speaker is what you need. The front door security camera intercom with monitor enables you to speak to the one coming up to your doors. Now, you can give instructions to the courier and send the salesman away by talking to them directly via your phone easily. Not only does the front door security camera with monitor provide you a disturbance-free life at home but also at the workplace. You will now know whether the postman cuts across your garden from next door or walks up the doorway, wherever you are. Another piece of trifles gets off your mind. Considering adding a residential front door security camera but hesitate at the second thought for the agreement with house owner? Now, a wireless front door camera could get you out of the dilemma. But please note that it’s the wire-free WiFi front door cameras, powered by batteries or solar panel, that you should be looking for. This kind of wireless front door video camera needs NO wires at all to work. So there will be no drilling and no holes. By contrast, the wireless entry door camera people usually talk about will still need a cable for power. So if you are renting a house and want to avoid any argument with the house owner, it’s best for you to get a wireless front door security camera with intercom that is battery powered. Have wasted a lot of time waiting for the front door camera installation due to the slow response of the security company? It’s time to switch for a DIY front door security camera system. 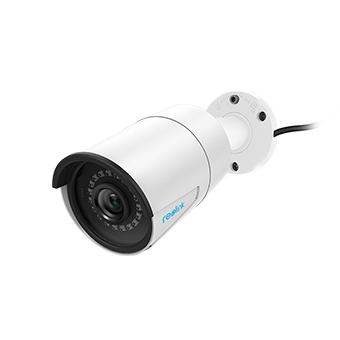 The PoE front door camera is plug and play and easy to install even for beginners. Compared with analog cameras, the PoE front door viewer camera breaks the limitation of distance. The signal will not weaken with the increasing distance like the coax cable. 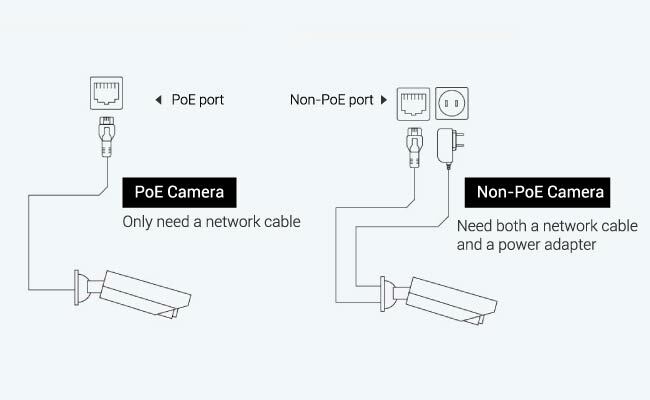 Compared with non-PoE cameras, the PoE front door CCTV only needs one power cable to work. For example, Reolink RLC-410 is the one that allows you to DIY your own security solution in a simple & efficient way. Or you may just turn to the battery powered cameras with NO cable to deal with at all. Want to realize the above all in one single camera? 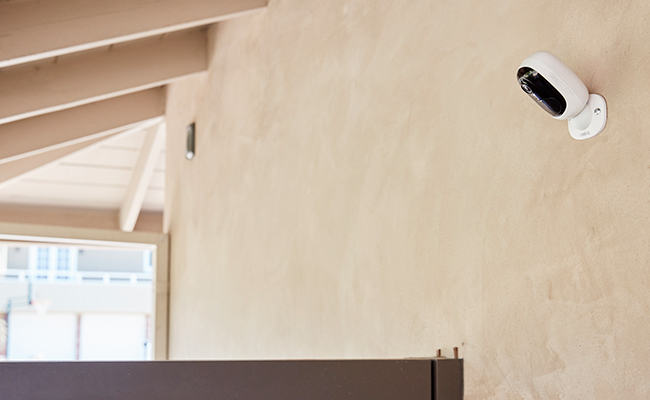 Here are top 3 simple security cameras for front door to help you deter and catch burglars, keep an eye on your kids, manage your life, and give you real peace of mind. Compared with the wireless front door video camera, the wire-free Reolink Argus goes a step further with NO wires at all literally. You can simply never find a front door security camera that is easier to use and install than this on the market. And you should have no worries about this smart front door camera’s battery life which could last for 4-6 month per charge. 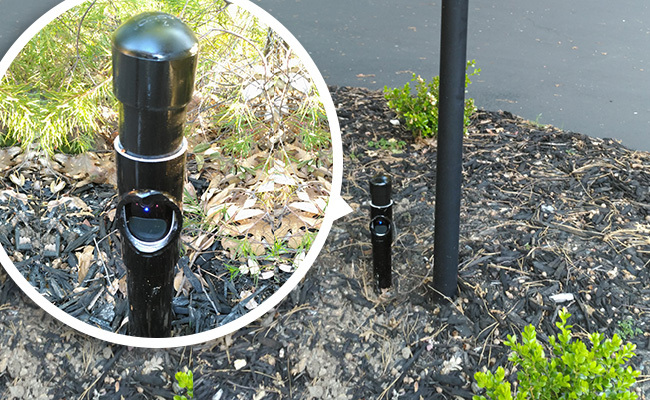 And if you use it with Reolink solar panel, the power will be literally non-stop! The battery camera would be the best front door camera for apartment if you prefer a front door WiFi camera. But what if there is weak or NO WiFi in your front door area, or you just want to save the bandwidth of front door IP security camera? The 4G/3G front door home security camera is here for you. 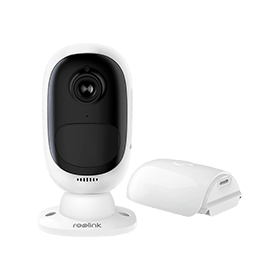 Running on the cellular data, just like your phone, Reolink Go cellular security camera can work independently and save your network bandwidth at the same time. If you don’t mind running wires, then the Reolink RLC-410 will be your best budget pick. But don’t worry too much about it. The PoE feature has made the installation much easier to simply plug and play. And a bonus point to this outdoor front door security camera is that it is 3rd-party compatible, meaning you can run this front door security camera with audio on the 3rd party software like the Blue Iris or iSpy without any compatibility issue. During your research on front door cameras, you may come across many hidden front door security camera options like the front door keyhole camera, front door camera light, lock or doorbell. Small and non intrusive as those front door entry cameras are, they are usually rather limited in features. For example, the wireless front door peephole camera may provide blurry videos and most of them are not night vision enabled. More than that, this type of front door entry CCTV camera can’t be connected to TV as the front door CCTV system (with an HDMI port on the NVR, front door camera recorder). There could be all kinds of concerns that guide your choice, whatever it is, never forget to check the cameras’ warranty, especially when you get the cameras from the Costco, security camera agents. Another important thing that should raise your attention is the shipping fee if you are going to purchase a house front door camera online. For example, if you are going to find a front door camera UK or Canada, you may get charged with additional shipping cost. 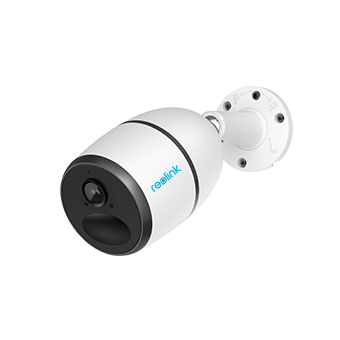 Actually, some reputable brands, including Reolink, has a wide range of best front door IP cameras with 2 years warranty and free shipping worldwide to give you real cost-effective and worry free purchase. This entry was posted in Buyer's Guide and tagged front door cameras, reviews, secure front door, selection tips.